Going to fall festivals are one of the most fun activities of fall! You get to enjoy the beautiful weather, listen to live music, eat good food, and so much more. 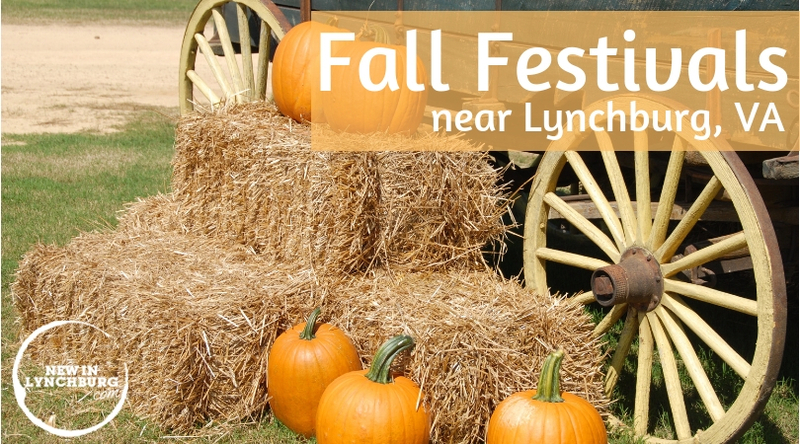 This list includes over 40 fall festivals in the Lynchburg, VA area. Check them out! Don’t forget to use #FallinLynchburg so we can see your fun fall photos! Bring your own chair for bluegrass band Nothin' Fancy and a lineup of special guests. Food vendors will be on site. Tickets $30/day in advance or $35-40/day at the gate. 3 day pass $75/person in advance or $90/person at the gate. Children 12 and under free with paid adult. Cash only at gate. Camping available. The 12th Annual Heritage Harvest Festival, hosted by the Thomas Jefferson Foundation, celebrates Jefferson’s legacy and the contributions to American cuisine by enslaved workers, in a family-friendly, exciting, affordable and fun-filled atmosphere, promoting gardening, sustainability, local food, and the preservation of heritage plants. Enjoy music by The Worx while sipping on various Shine & Wine made from all over Virginia. There will be some bourbon, vodka, gin & whiskey to go along with that Shine. Beer will be available on site. Artisan and food vendors will be on site. We are under pavilions making this a rain or shine events. Must be 21 to enter. Advance tickets on sale at chasecityevents.org. Live music will be performed by the band Wag the Dawg, which plays music spanning from the 1960's right up to today's hit. The band features Pop, Rock, R & B, Country Rock and Country music so there will be something for everyone to enjoy while tasting their favorite wines from across the region. Purchase tickets here. This is a family event with grape stomping tubs for both adults and children. No admission fee but there is a grape stomping fee of $10 per adult and $5 per child. Live music by local band “Awesome Sauce” from 2-5pm! Celebrate Greek culture with authentic Greek cuisine, live entertainment, Greek dancing, family fun, and more! Free admission. After years of planning, Grayhaven and the Abrams/Peple family launched the first South African Food & Wine Festival in the U.S. in 2006. The idea was to introduce visitors to the unique cuisine, wine, food, music and culture of South Africa through a two-day festival held outdoors on the winery grounds. What started as a modest local festival has grown into a successful grass-roots cultural event attended by thousands of visitors from Nova Scotia to California to Florida, and of course Virginia. Grayhaven and the Peple/Abrams family, along with over 150 SA Festival volunteers, invite you to experience a taste of South Africa at the 13th annual South African Food & Wine Festival in 2018. This year's Bedford County Fair will feature a variety of events to attract all ages and interests including a pageant Sunday prior to the fair, a talent competition on Thursday, school tours on Friday, a youth livestock show on Saturday, and an antique car show, antique farm equipment show, and a community worship service by Liberty University on Sunday. The event will feature a series of educational demonstrations and live bands throughout the days of the fair. In addition, Dreamland Amusements will provide a new variety of mid-way rides and attractions for families and children to enjoy. Entrance and parking are free; ride tickets will be available for purchase. Wear Bavarian attire and b.y.o stein to this fun-filled festival. Tickets $35/person. Come on out September 29 from noon - 6 pm to get some awesome food, listen to speakers, grab a beer or wine, and learn about all the ways veganism is for the animals, the people, and the planet: a win-win-win! Washington Park is gorgeous, so plan to hang out (bring your dogs and your kids) with us under the trees—and get to know more about animal and social justice. And, hey, if you’re new to veganism, we’ll have experts on hand who can talk nutrition, menus, and shopping. This is gonna be good! Now in it's 27th year, the South Boston Harvest Festival has become a favorite with kids and parents alike. Enjoy the attractions, entertainment, activities, and food that are fun for all ages! The 30th Annual Smith Mountain Lake Wine Festival is on the lake again! Virginia wineries will be pouring and presenting their latest vintages, along with carefully selected craft and food vendors. Musical entertainment provided by NYC-based Weird Science on Saturday and Barefoot West on Sunday. Advance Taster Tickets are $26 & $16 for non-tasters. At-the-gate prices will be $36, and $26, respectively. Tickets available here. Rain or shine. The Jeter Farm Fall Festival and Country Store opens Saturday, September 29th and continues every Friday (3-6pm), Saturday (9am-6pm), and Sunday (12pm-6pm) through October 28th. $10 general admission includes corn maze, hayride, barnyard zoo, slides, games, and a free pie-pumpkin! Hamburgers, hotdogs, kettle corn, apples, cider, and many more VA Grown and VA Finest products are available in the Country Store. The Pumpkin Festival is known as “a family tradition” and offers many family-friendly attractions for the young and young at heart, including hayrides to the pumpkin fields to pick your own “great pumpkin,” a brain-twisting corn maze, farmyard animals and fantastic live music on two great stages every weekend in October. Every weekend: Ride-A-Rescue Horse for $12 a trail ride. Creative Expressions Face Painting and Balloons will be there every weekend along with Ed’s Carved and Painted Pumpkins and Blacksmith, Chainsaw, and Corn Shelling Demonstrations. Fridays have special pricing with limited attractions. Wagon rides will cost $2 to the pumpkin patch. Corn Maze will be $5/person. Enjoy ice cream, coffee, cider, hot chocolate, pumpkins, gourds & squashes for sale, retail sales, wagon rides, and corn maze. Kidz Zone will be open with parental supervision. This annual Apple Festival has a wide range of activities for all ages including hayrides to the pumpkin patch and corn maze (weather permitting), an apple sling shot, a kids zone, food, and country music. There will be an assortment of delicious seasonal food and treats available for purchase, as well as Drumheller Orchards' own locally-produced food such as apple cider, apple butter, and much more. This day of family fun brings living history demonstrations, local food trucks, kids’ games and crafts, music by MadLad and The McKenzies and more to this beautiful property. Admission is free! Activities and demonstrations during the festival will include open hearth cooking, mourning customs and hair jewelry, period fashion, blacksmithing, and cider making and tasting. In the Carriage House, Patches and Pieces Quilting Guild will display quilts made by their members. For kids, there will be games from long ago and today, including a jump castle, sack race, pumpkin decorating and a petting zoo. When the whole family gets hungry, there will be food trucks, snack vendors and a bake sale on site. A variety of other vendors will fill the grounds with clothing, jewelry, accessories, decor, personalized crafts and more. In addition, free guided tours inside the Point of Honor house will be available all day, and the gift shop will offer 10% off all purchases on unique gifts, books and prints, and ceramics will be on sale. This annual festival has been going on for over 30 years! You will still find members of the Flippin and Seaman family working at the festival and making apple butter with their families' secret spice recipe the old fashioned way—in large copper kettles being constantly stirred. At this festival you can pick your own pumpkins, eat delicious food, walk through a corn maze, visit with Mingo the Clown, see a cider pressing demo, and buy all kinds of apples, apple butter, jellies, ciders, and more. This is the 39th Annual Oktoberfest! It will be fun for the whole family: there will be vendors selling art, crafts, holiday decorations, jewelry, household accessories, etc! You can choose from numerous food vendors, tons of kids' activities, plus a beer garden, music & more! Free admission! Come and celebrate the fall season the first Saturday in October at the Annual Harvest Days Festival! Vendors will line the streets facing the storefronts and sidewalks along Virginia Avenue offering seasonal crafts, specialty items, antiques, collectibles and antiquities. In addition, the one-of-a-kind specialty shops and restaurants will offer specials throughout the downtown area, along with a host of games & crafts for the kids to participate in and a variety of farm animals to see & ponies to ride. Come out and enjoy the beautiful autumn weather and the activities that are available. Free admission. Celebrate German culture at the annual Oktoberfest at the Frontier Culture Museum. There will be traditional food, dancing, beer brewed using traditional Old World methods, music, and family-friendly fun. Your ticket gives you admission to the entire museum, so come early and tour the German Farm relocated from Hordt, Germany. Adults: $12; Children (ages 6+): $7; Children (ages 0-5): free. 25+ Virginia wineries. Live music. 100 vendors. Food trucks. Powhatan knows how to uncork and unwind. Party in the streets with 8,000 of our closest friends while tasting the best Virginia has to offer. Help us celebrate a sweet sixteen years of the Festival of the Grape with reds, whites, roses, and a few sparkling surprises. Explore Historic Courthouse Village when it transforms into a crossroads of arts, crafts, brews and live music from Flashback and Route 64. Adult Tickets $25 Advance, $30 Gate | Youth Tickets $15 Advance, $20 Gate. The Annual Fall Festival features over 100 vendors offering raffles, crafts, food, and educational exhibits. Music by local musicians on the ‘trailer-stage’, corner of Court & Main. The Old Brick Hotel and two cabins open all day with special displays. Plus horse rides, blacksmith and potter. Fun for the whole family and everyone is welcome! This festival will include live entertainment by The Sauerkraut Band and the local Saengerbund, who will perform authentic German-style music in traditional Bavarian clothing. There will also be artisan crafters selling their handmade wares and merchandise as well as a children's play area, German games and entertainment for both kids and adults, an Oktoberfest-style Strongman contest, German food, and a special Oktoberfest beer brewed by Sunken City Brewing Company. Admission for adults is $10 on event day; pre-order adult tickets for $5 by clicking here. Children under 13 are admitted free. Lawn chairs are welcome. Join us as we turn the streets of downtown Waynesboro into an outdoor fine art festival for the weekend! 150 fine artists and artisans will showcase their works including painting, printmaking, wood, pottery, glass, jewelry, sculpture and more. These artists are hand selected by our standards committee to bring high quality arts and craft to this two day outdoor fine art festival. You can also enjoy gourmet food trucks, craft beer, and great local music. This family-friendly festival commemorates the Norfolk & Western Railroad's donation of the Appomattox Depot to the Town of Appomattox in 1973. The two-day festival is held on Main Street and the surrounding downtown area. Festival highlights include a parade, arts & craft vendors, live bands, train exhibits, a fine art show, fireworks, food, and lots of activities for the entire family. Virginia wines, live entertainment, arts, crafts and GARLIC! Tastings by guest wineries, multiple stages with live entertainment, over 150 unique arts, crafts and specialty foods. The Virginia Wine & Garlic Festival is Virginia's largest agricultural festival. We welcome you to scenic, busy and friendly Clifton Forge, Virginia to view the splendor of Autumn foliage and browse through the many exhibits and shows in downtown Clifton Forge. Many types of crafts can be purchased such as handmade jewelry, wooden toys, quilts, Christmas ornaments, wood carvings, and leather goods. Typical tables at the flea market will contain a variety of antiques and collectibles: glassware, furniture, books, silverware, pottery, china, and other items to numerous to mention. The flea market, which lines the main streets of the town is one of the biggest drawing cards of the festival. Local civic groups and organizations have a myriad of refreshments made on the premises, including fresh doughnuts, country ham sandwiches, roast beef sandwiches, home baked goods, hamburgers and hot-dogs. Musical performances can be heard almost nonstop from such diverse types as gospel, country, blue grass, rock bands and local high school. Now in its 28th year, the Fall Foliage Bike Festival attracts over 750 cyclists from around the mid-Atlantic states for a weekend of riding in the beautiful Shenandoah Valley. Escape the cities for a quiet weekend and choose from over eleven SAG-supported routes over two days. Mountain View Vintage Market features premier vintage, antique, and farmhouse decor vendors from Virginia, North Carolina, and Pennsylvania. These vendors have a variety of treasures waiting for you. In addition to these vendors, we have amazing high end, handmade artisans. You will find one of a kind home decor, gift items, and of course, items for the holiday season. Come out and enjoy these fabulous vendors, grab a bite to eat with our delicious food trucks, take the coolest photos, and relax with live music and a gorgeous view!! Admission is $3 and a portion of the proceeds will go to Family Life Services. Tasting starts at high noon! Bring a chair, your dancing shoes, and be prepared to sample the area's best chili! $10/person in advance, $15/person at gate, children 12 and under are free. Enjoy a Great Ginger Pumpkin Cocktail while listening to live music by Sharif and eating Poke-E-Joes BBQ. Come out and enjoy a fun-filled event for all ages! There will be craft demonstration, kids' activities, apples and cider, food, entertainment, vendors, displays, and more! Enjoy pumpkin carving and painting, candle dipping, apple pressing, face painting, 19th century children's games, an apple slingshot, a candy maze, and more. Wagon rides for $3/person or $8/family run every hour from 1-6pm. Enjoy the sunset and sip hot cider by the bonfire at 6:30pm. When darkness falls, take a spooky trail at the amphitheater. Enjoy over 75 different options of craft beer, ciders and wine all hand picked and selected from right here in the state of Virginia. Local artisans, delicious food and live music round out this event. The Sampling Admission Ticket includes ten 4oz. beer and cider samples and unlimited wine samples along with a commemorative beer or wine glass while supplies last. $25/ advance. $30/ gate. Under 12 are Free. $15/ Designated Driver (non drinking). Are you looking for a spooktacular night of family, food, candy, and fun? Come to this annual Fall Festival! Dress in your best costume and be ready to have a great time with our community. This festival combines a love of history with a loveof music, barbecue and Virginia craft beer! The Bluegrass, Barbecue & Brew Festival brings together the lifestyle of yesteryear with modern leisurely activities. The intention is for the people to fall in love with Southern Virginia and all of the history, culture, food, beer and music it has to offer. Enjoy music from three incredible bluegrass bands: Breaking Grass, Joe Mullins & Radio Ramblers, and Nothin’ Fancy. There will also be delicious local barbecue, Virginia beer/wine/cider, and arts and craft vendors. Make your way downtown for a day of shopping, dining, and fun featuring handmade vendors and food trucks. Jefferson VIP Wine Festival passes—which include access to a private tent, heavy hors d’oeuvres, a private audience with Mr. Jefferson himself, a special tasting and more—and general admission tickets, which include tastings and a complimentary Poplar Forest wine glass are on sale below. We’d love to see your fall festival memories! Tag us using #FallinLynchburg so we can see your fun Fall photos! Check out more Fall fun by checking out pumpkin patches and apple orchards near Lynchburg, VA and fall races, marathons, and 5Ks near Lynchburg, VA.
You can also check out our events calendar and subscribe to our newsletter to stay up to date with events going on around Lynchburg! Did we miss something? Use our contact form to let us know!